"Hello, I am Torie and I am so happy to have been invited by the lovely Emma to share my colour story. Torie Jayne is my blog where I share my inspirations, crafts, gluten free baking, interior ideas and designs and everything else between. I think it would be fair to say I am known for pastel colours but what perhaps you don't know about me is that I am a little obsessive about colour. My Dad describes it as a medical problem and my partner describes it as military! Hmm, I think I need to explain a little further and give you some examples so you can make up your own mind. 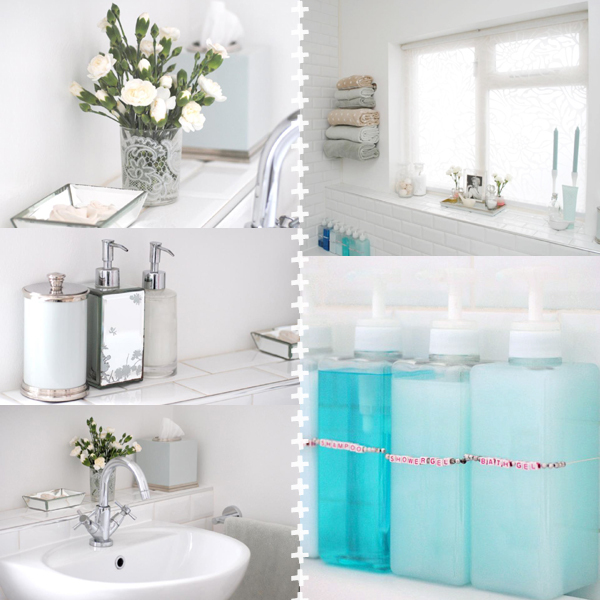 Let's start with our bathroom where I have gone for a vintage modern style in a colour palette of white, silver sage and chrome, so far so good, but when it comes to my shower and bath toiletries I like them to be in keeping with the rest of the room so I ban any toiletries in there original packaging being on show. Therefore I dispense them into plastic bottles and label them with alpha beads, thank goodness my partners choice of shampoo and shower gel are fitting! When it comes to our kitchen my obsession becomes a little clearer as everything out on display is in shades of duck egg blue, with a smattering of pink, stone and blue. Which means that I insist on buying a particular brand of washing up liquid and sponges and therefore you can imagine my delight when I found dishcloths in duck egg blue on a trip to Copenhagen! 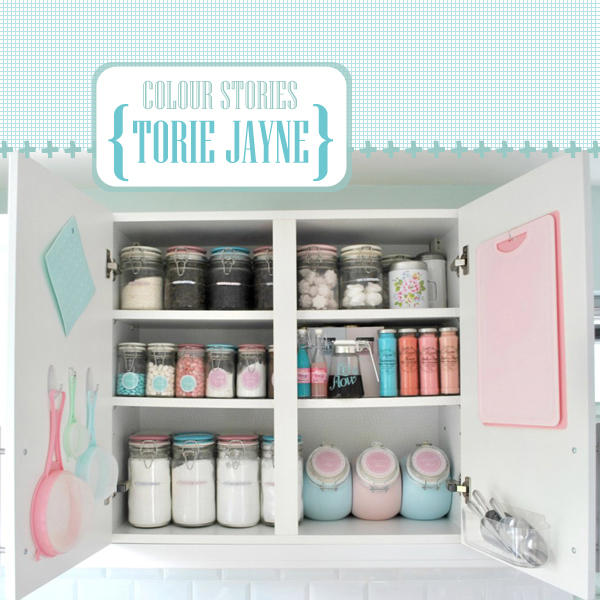 Take a look inside my kitchen baking cupboard and my love of colour becomes clearer or scarier? But hey, it makes me smile! 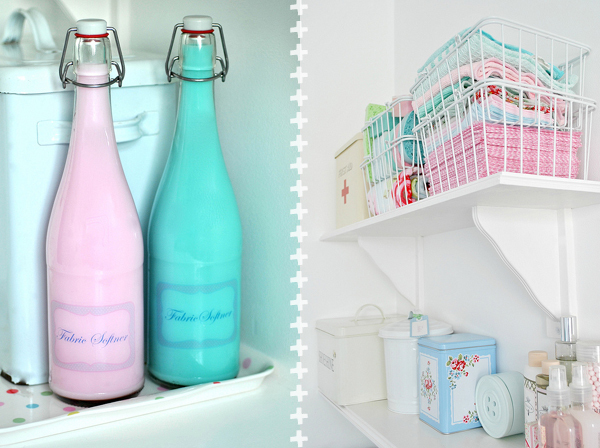 Then there is my laundry room with a housekeepers box that is full of pretty pastel cleaning products and utensils, dispensed fabric conditioner into handmade printed bottles and baskets of cloths, dusters, sponges and tea towels all in pretty pastels... of course! My Dad has collected stamps since he was a young boy and I liken my colour obsession to him collecting stamps as I get as much enjoyment in "the hunt" for that elusive duck egg blue garlic press as I do when it is in my hands. But the joy I get when it all comes together is what makes me really happy!" Oh, isn't is all just gorgeous! 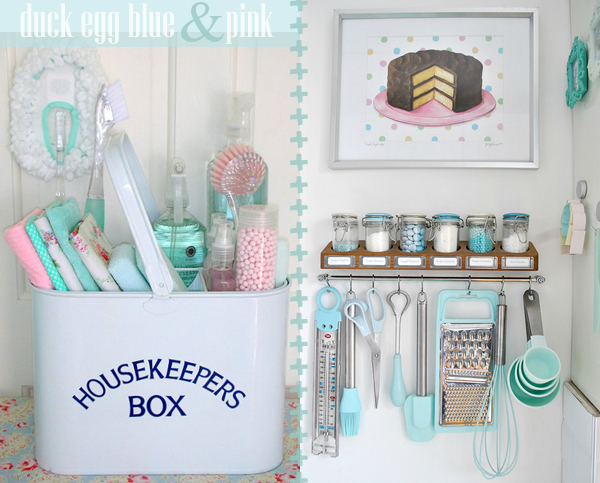 I have a huge admiration for Torie's passion in maintaining her beautifully ordered and co-ordinated pastel world. I can only begin to imagine the number of hours she has put into sourcing and creating each and every object, not allowing even the smallest detail to go unnoticed. When I first talked to Torie about sharing her colour story we giggled about her colour obsession, but after reading her story and seeing her beautiful pictures I don't see it as an obsession at all. This is a girl who know what she likes and what she likes makes her very happy. So why should she ever consider compromising her happiness!? What a gorgeous house! I've been inspired. Oh so neat and elegant and ...... pastel! Makes me want to go and tip out my pantry contents - there would be nothing, but nothing, left!!! I love what Torie does but I wouldn't get away with it here so I take it that her husband loves those colours too or else he is the most amazing, most in love with his wife, man anywhere! I think it's inspirational! Why shouldn't we be so intentional and happy. If only my partner was so...accommodating.